Two-straight NBA Finals appearances. An Olympic gold medal in Rio de Janeiro. There is only a little over a month remaining before the highly touted and scrutinized Golden State Warriors begin training camp, too. Yes, Draymond Green is exhausted mentally and physically. Even so, a very long trip to the Springfield, Massachusetts, was a must for him. It’s not every day that you can witness your old college coach and close friend get enshrined into the Naismith Memorial Basketball Hall of Fame, which will be the case for Michigan State men’s basketball coach Tom Izzo on Friday. “Just to be there for him at the stage, a big moment,” Green told The Undefeated. “I can’t remember a big moment in my life that he hasn’t been a part of. When there is a tough time in my life, he is there for me. For me to sacrifice a few hours for one of the biggest moments of his life is a no-brainer for me. Green and Izzo’s relationship dates to 2008 and is surprisingly still quite strong despite the NBA veteran’s departure four years ago. Green actually originally committed to the University of Kentucky while starring at Saginaw High in Michigan. That decision changed after coach Tubby Smith left Kentucky with four years left on his contract to coach Minnesota. Green didn’t think Michigan State recruited him hard previously, but once he opened his recruiting back up, Izzo was his first and truly last meaningful recruiting call. It was Izzo’s honesty that ultimately persuaded Green to stay close to home by signing with the Spartans. Green had NBA dreams since childhood, but admitted he had “no clue how to get there” entering Michigan State. Izzo pushed him to help make his dreams a reality. “As a freshman, I didn’t know how to work,” Green said. “I didn’t know what hard work was, what it took to become what I’ve become or who I was at Michigan State. He was so hard on me as a freshman to try to show me what it took that I didn’t understand it. It’s hard for you to sit there and listen to someone say they care about you so much but yet they’re yelling at you every day. 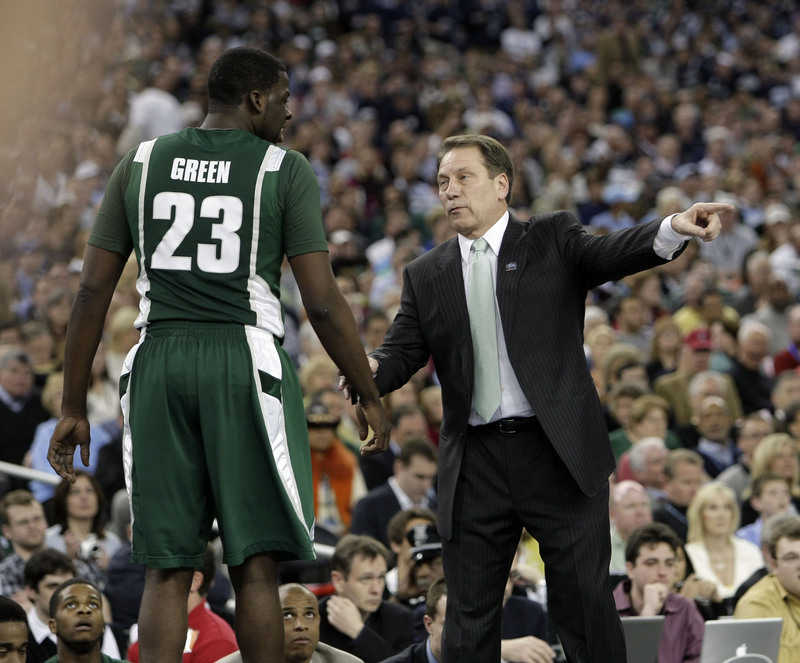 Michigan State head coach Tom Izzo (R) gives instructions to forward Draymond Green during the first half against Connecticut in a Final Four game at Ford Field at Ford Field in Detroit on April 4, 2009. Izzo called Green one of the “ultimate winners” he ever coached. Green described going to Michigan State as “the best decision of his life” and donated $3.1 million to his old school last year. “Draymond put our program, our school, me and everyone else in front of him. I always knew winning was the most important thing to him,” Izzo said. Although Green has an instrumental stepfather whom he calls his dad in Raymond Green, the 2016 NBA All-Star views Izzo as a secondary father figure. Case in point: Izzo attended about six of Green’s games last season. That included Game 6 of the 2016 NBA Finals in Cleveland to support Green after he returned from a one-game suspension. While the racial difference is obvious, Green added that they see each other simply as human. Green has gone on to become an NBA champion, NBA All-Star and one of the league’s most loved or hated players. He went from making the rookie minimum, being paid less than $1 million in each of his first three seasons, to landing a five-year, $85 million contract as a free agent last year. He has had a tough stretch since June, however, with his Finals suspension, criticism of being too physical on the floor and apologizing for accidentally putting a lewd picture on social media while preparing for the Olympics. “He is always somebody to talk to,” Green said. “Sometimes you just need somebody to talk to that can give you an unbiased opinion. Sometimes you need someone to just listen. He’s there for all the tough times on the phone with me, calling someone else and then calling me back. This stuff is not his obligation at all. Izzo says the Warriors forward is still learning to adapt to his stardom and a much grander paycheck. He expects Green to “tweak a couple of things” and still be a leader with the Warriors next season. “I talked to him a lot after all the things that happened,” Izzo said. “I told him that all of us have to learn how to adjust to the fame and realize that even if we are not doing anything as wrong as it seems on some of it, you’re being portrayed different. You go from $900,000 per year to $85 million. I’m not sure I’d handle it too good. Izzo’s coaching resume includes 524 victories, 12 conference titles, seven Final Four appearances and a 2000 NCAA title. He said that he told his wife, Lupe, that he is going to make sure he truly enjoys the Hall of Fame weekend. Green says that Izzo will “probably cry” during his Hall of Fame speech, but is not sure what to expect. “He’s so passionate about what he does that it’s hard to gauge what his reaction will be,” said Green, who is scheduled to arrive in Springfield on Friday. What could be gauged was Izzo’s reaction to a busy Green coming to Springfield.